Cast your ballot in the 2005 Goldies Readers Poll. 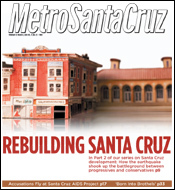 In part 2 of our series on Santa Cruz development: How the earthquake shook up the battleground between progressives and conservatives. SCAP Scrape: The controversy around Santa Cruz AIDS Project has become the hottest story no one wants to talk about--but will anything come of all these accusations? Anti-Gravity: For Trisha Brown's dance company, Newton's universal law is more like a suggestion--and they've politely declined. The Rock Show: Songwriter's Showcase; Camper Van Beethoven; GWAR. Are You Vegetarian Enough? : And other ethical head games carnivores love to play with meatless eaters.